Customer Relationships For The Win! LibCRM is a Customer Relationship Management platform built for the specific needs of libraries. Offer a superior customer experience by gaining a better understanding of your users and their needs. Powerful task management and flexible design help outreach, development, and liaison librarians track relationships and demonstrate value. LibCRM is designed for the specific needs of libraries with built-in flexibility to account for your unique customer data. The system is fully customizable for your library – tailor it to capture your distinctive fields and parameters. Define the groups with which you interact. Undergraduates? Faculty? Young Adults? Seniors? What about organizations or departments? Academic Advising? Vendors? City Council? Customize People and Organization types to suit your demographic. Define which fields to gather for each Group. For example, your Faculty Group might have a 'Tenure' field, whereas your Vendor Group might store Product Subscription info. Run full statistics and reports based on customized fields you defined for full insight into the effectiveness of your outreach efforts. How Do You Interact with Your Demographic? From email, to in person, to phone – customize your interaction types. This way, when you record an interaction with a Person or Organization, you’ll have all your communication methods right at your fingertips. 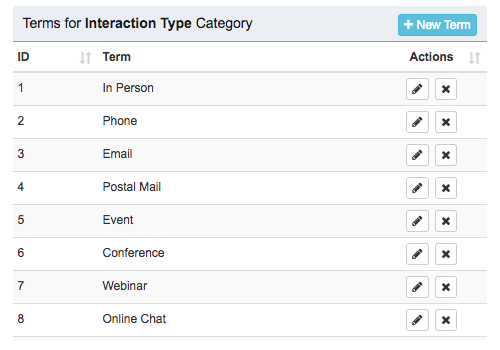 Once interaction types are defined, you can run a variety of reports showing the popularity of each interaction type. Cross-reference this with demographic data for deeper insight into users' communication preferences. What’s That Twitter Handle Again? Each Person and Organization can have a number of Internet/Social profiles associated with their record. 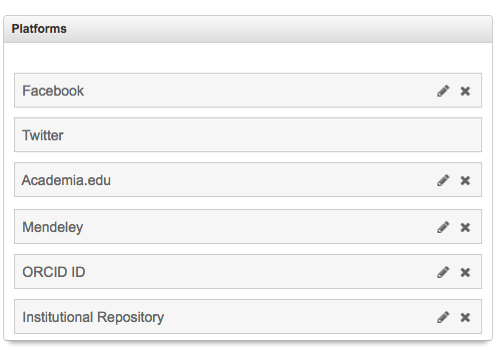 Add Facebook profiles, Academia.edu, Mendeley, Twitter, ORCID ID, or even a link to their profile in your institutional repository. LibCRM extensive reporting options enable you to compare which social channels generate the most buzz from your users. This will help your librarians target social media management for maximum reach and engagement. Optionally, your library can also record donation activity and interact with valuable donors right from within LibCRM. 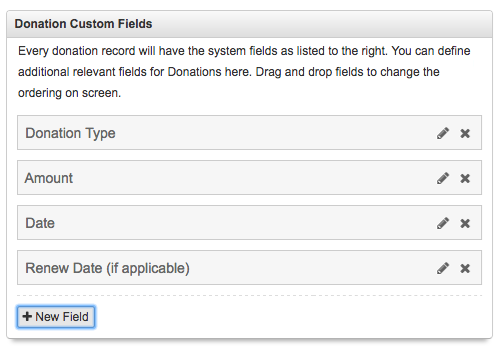 Define fields to track and associate with each donation record. Donation type, amount, date, organization, etc. Produce a variety of reports on the Donation activity from within LibCRM. See who are the most valuable donors, compare historical trends, etc. All users, organizations, and entities have profile pages in LibCRM. View contact details, social profiles, and relevant interaction info in one place. Enjoy a holistic view of the depth and the quality of your relationship and interactions. To fully understand a particular customer, LibCRM offers a view of their inter-relationships with other users and with organizations & groups to which they belong. Store all your relevant documents and notes related to your users and organizations all in one place, neatly organized, and available to all authorized LibCRM accounts. Knowing the history of previous interactions helps you better tailor services and meet customer needs. 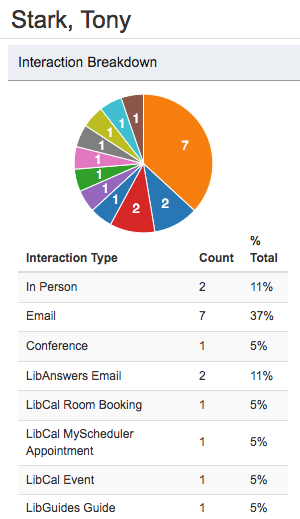 LibCRM is your "big picture dashboard" of activity and interactions with your community. LibCRM has full Task Management functionality built-in. Administrators can assign tasks to individual librarians (singly or in bulk), and everyone can follow the progress of the library's outreach efforts. Create tasks that are assigned to one or more accounts. Improve collaboration by assigning tasks to multiple librarians. Define due dates, associate tasks with larger projects, and mark as complete when finished. 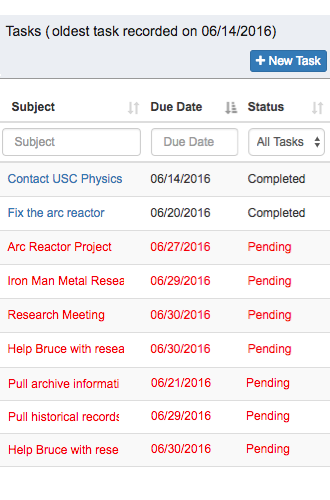 Each librarian can view their unique assigned tasks right from their Dashboard. Overdue tasks are outlined in red. Export options are available in a variety of formats. Working with multiple colleagues on a major project or outreach activity? Bulk-create tasks and assign to multiple users quickly and efficiently. LibCRM helps you better understand your customers and the community you serve. Your most loyal customers will also appreciate the librarians having better insight into their research and information-seeking needs. Customize the library experience for each group of customers. Manage outreach and liaison activities in one centralized place. View librarian activity to demonstrate value and contributions. Identify gaps in your outreach efforts and create projects/tasks to address them. View your interactions with community organizations, partner libraries, or vendors. Integrate LibCRM with your other Springshare tools so that patron activity with LibGuides, LibCal, LibAnswers, and LibWizard is automatically recorded. When a new LibGuide is created at the request of a faculty member, patron, or organization, instantly record that activity right inside that LibCRM profile. 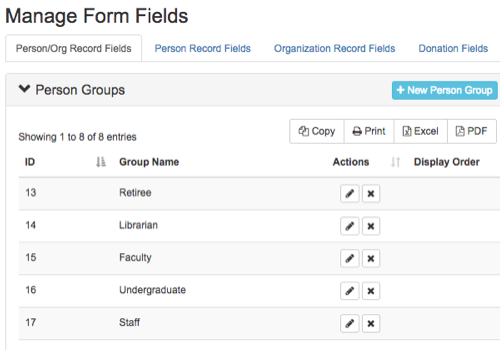 When an E-Reserves course page is created, LibCRM records the interaction automatically and associates it with the faculty member and their department. Based on your permissions, LibAnswers tickets and LibChats can be associated with LibCRM users' profiles. You’ll always know what questions they’ve had about library services. Research Consultations and Appointments booked with LibCal’s My Scheduler are automatically added to their LibCRM profile. All reserved rooms / spaces and event registrations from LibCal are auto-logged right in their LibCRM user profile. When patrons fills out a satisfaction survey or an online assessment, that information is funneled right into their LibCRM profile. Additional Integrations with systems within the library are possible using LibCRM's APIs so that manual entry is minimized while the library gets a more complete picture of how users are interacting with and utilizing the many services that the library offers. Each of these integrations is fully customizable by local administrators to comply with institution's privacy regulations. CRM platform tailored for needs of libraries. Your users are your most important asset and LibCRM helps build and cultivate relationships with your user community.